Take a teal and brown fabric T-shirt and cut its body into quarter-inch strips. Made of 100% cotton, these T-shirts are soft and firm enough to make a necklace. Cut the hem off this T-shirt as you will not be using it. Now cut out the desired amount of strips from the T-shirt. Stretch all the strips out one by one and do this until they are really thin. Cut one more quarter-inch strip out of the T-shirt and cut this one further in half. You can skip cutting the last strip by knitting the strips and tying the side of your necklace. Now put the necklace straps around your neck and hold them all on one side. Finally, use the braided or knit strips to tie the necklace on the sides so they are not loose. You can hide the ends of the strips by either cutting them off or tucking them underneath. Once you are through all these steps, your home-made, recycled necklace is ready. You can use the left out or fresh strips to make a necklace locket. Take an old stone studded locket, put that in the strip and one more great necklace is ready for you. 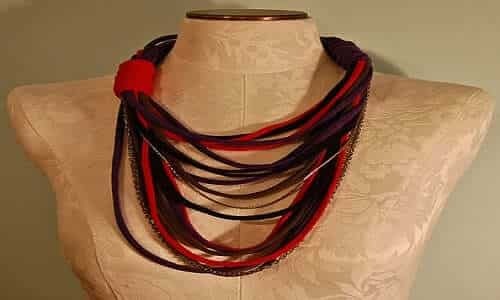 You can use two strips of different colors to make a livelier necklace. You can also take a locket necklace and use its chain along with the T-shirt strips. This will give your necklace a metallic touch. Now pair these unique necklaces with different garments and give yourself a nice look!